State Department says NGO which received funds from charity headed by Ambassador David Friedman is legitimate group, not terror org. 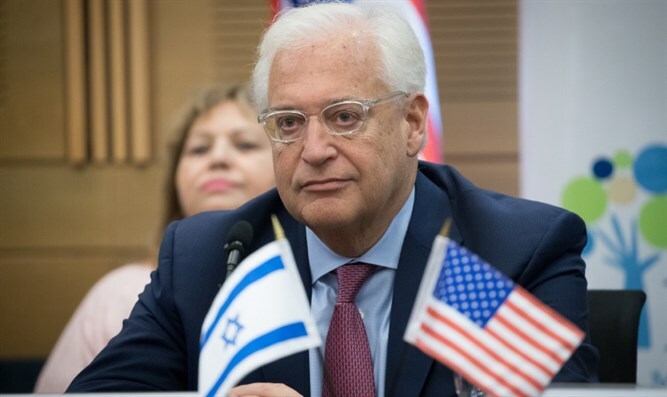 The US State Department defended American Ambassador to Israel David Friedman from claims that a charity he once headed had donated money to a group designated as a terror organization. Earlier this month, several media outlets reported that Ambassador Friedman had, prior to being tapped for the ambassadorship, overseen the donation of $12,000 to Komemiyut, a group the reports claimed was designated by the US State Department as a foreign terrorist organization. Friedman, who later severed ties with the charity, was president of the organization at the time of the donation, in 2013. The claim was based on a report by the left-wing “Democratic Bloc” organization. According to a report by JTA, the recipient of the donation, the NGO Komemiyut, had confirmed its ties with a prior organization of the same name in Hebrew – Qomemiut. Days later, however, both Rabbi Moshe ‘Mussa’ Cohen, the head of Komemiyut, and Baruch Marzel, cofounder of Qomemiut, spoke with Arutz Sheva, denying that the two groups were at all related or had, to their knowledge, any of the same members. Qomemiut was founded in 1994 by former activists of the Kach party, after Israel banned the group, following the Baruch Goldstein incident in the Tomb of the Patriarchs in Hevron. The group was later listed by the US State Department as an alias of the Kach movement, which had been designated as a foreign terrorist organization. Twelve years later, a group of prominent Religious Zionist rabbis sanctioned the establishment of an outreach organization, Komemiyut, dedicated to strengthening Jewish identity in Israel and preventing future evacuations of Jewish communities in Judea and Samaria. Following the report by Arutz Sheva, JTA spoke with a State Department official, who confirmed that Komemiyut – the organization which received the donation from the charity once headed by Friedman – was not a terrorist organization.